The recently unveiled LG G Flex 2 definitely looks to be one of the most interesting new smartphones unveiled this year, although that’s not necessarily saying much given that 2015 has only just begun. A plethora of other impressive handsets are scheduled to come out further along the line, including another one from LG themselves. The Korean tech giant is currently putting the finishing touches on the LG G4, which will reportedly make its first official appearance this March at MWC. With the LG G Flex 2 being praised by so many it will be interesting to see if LG will manage to outdo themselves with the upcoming flagship. While the LG G4 is still a few months away, we already have a pretty good idea of what the smartphone will offer thanks to all the leaks that are surfacing at a steady rate lately. Admittedly, leaks do not compare with announcements, but at the same time, unofficial information turned out to be very accurate on more than one occasion in the past when it comes to smartphones. That said, we decided to gather the most believable information currently available on the LG G4 in order to see how the flagship will compare with the LG G Flex 2. 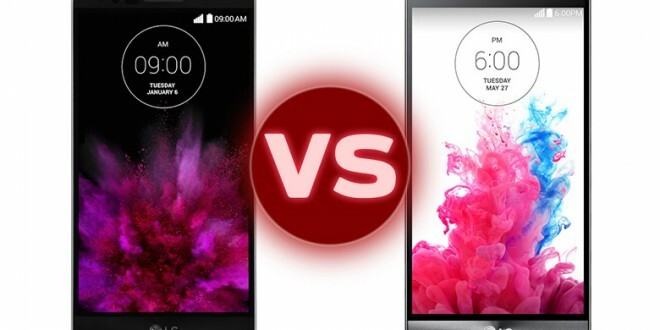 With that out of the way, let’s see how the two LG-made devices will stack up against each other. You only need to take a quick peek at the LG G Flex 2 to notice that the curved design is the main feature here. Its predecessor also featured a very similar design, but ultimately fell short of expectations due to how expensive and big the phone was. Learning from past mistakes, the folks over at LG have been wise enough to keep the display at a manageable 5.5 inches complete with 1080 x 1920 resolution and 403 pixel density. Another returning feature that was also pretty popular in the first iteration is the self-healing coating found on the back panel. This aspect has also been improved, with the LG G Flex 2 reportedly being able to repair itself in less than 10 seconds. It goes without saying that this only applies to small scratches, so don’t go throwing it around because it will likely not be able to heal any serious damage. The LG G4 may not come with a curved body or display (at least, as far as we know), but it will feature a smaller screen, which coupled with the high resolution should lead to even better clarity and realistic colors. The display is said to come in at 5.3 inches while the 1920 x 2560 pixel resolution will amount to a grand total of 554 ppi. Interestingly, despite being smaller than last year’s model, LG is apparently planning to turn the LG G4 into a compact phablet by adding a stylus pen to the mix. The LG G Pen stylus has already been patented so this is more than just a rumor, however, the company didn’t exactly confirm its presence alongside the LG G4 either. That said, the Korean tech giant made it clear that the upcoming flagship needs to be different if it wants to succeed and it is widely believed that this will be one of the aspects that will make it stand out from the crowd. There are plenty of large phablets out there, but a compact one would certainly be refreshing, although we’ll have to wait and see if people will look at it as being a real phablet or just a smartphone that happens to feature a stylus pen. The full specs list for the LG G Flex 2 was announced back at CES 2015 and we’re not exaggerating when we’re calling this smartphone a real beast. LG’s latest offering is the very first smartphone to put the new 64-bit Qualcomm Snapdragon 810 processor in the hands of the general public, which needless to say, gives the company all sorts of bragging rights. As it’s often the case with LG smartphones, this handset will be made available in two variants, each with a different amount of RAM and storage. As such, customers will be able to purchase either an LG G Flex 2 with either 2 GB of RAM and 16 GB initial storage, or 3 GB of RAM and 32 GB of storage. Elsewhere under the hood, you have a 13 MP primary camera with dual-LED and OIS, 2.1 MP selfie shooter, a 3,000 mAh battery, and a microSD card slot good for up to 128 GB additional storage. The LG G Flex 2 runs on the Android 5.0.1 Lollipop operating system straight out of the box. Moving on to the LG G4, it’s now pretty much guaranteed that we’re going to see the Snapdragon 810 CPU with Adreno 430 GPU here as well. As a side note, this an octa-core processor with four Cortex-A53 cores running at 1.5 GHz and four Cortex-A57 clocked at 2 GHz. Unlike the LG G Flex 2, the LG G4 is said to offer no less than 4 GB of RAM along with 32/64 GB internal storage memory options. We’ve already seen 4 GB of RAM on the Asus Zenfone 2 so the LG G4 will be another “world’s first” for the company, but it will still be a welcome sight nevertheless. Other specs should include either a 16 MP or 20.7 MP camera with dual-LED and OIS on the back, 5 MP selfie snapper on the front, microSD card slot for up to 128 GB additional storage, and a massive battery (possibly around 3,500 mAh) to power the whole thing. The operating system is expected to be some version of Android Lollipop, maybe even 5.0.2 or later, depending on what comes out until then. The official release date for the LG G Flex 2 is still “early 2015”, with most news outlets suggesting that it should be out by the end of this month, at least in some markets. There is some debated in regards to the price – especially in the US – but the consensus at the moment is that it should sit at around $600. This price tag is said to be for the 2GB RAM/ 16 GB storage version so the 3GB RAM/ 32 GB storage should be made available for at least $650. As for the LG G4, the flagship is expected to be officially unveiled at the MWC, which this year takes place between 2-5 March in Barcelona. The price will vary here as well depending on the storage, but word has it that the LG G4 will begin at $800 and only go up from there. On one hand, you have a truly innovative curved smartphones that packs powerful hardware including the world’s first consumer-ready Snapdragon 810 CPU, while on the other hand you have a flagship smartphone with even more powerful hardware, which may or may not end up featuring a stylus pen. Any of them would be a great choice for your next smartphone to be honest, but I can see the LG G Flex 2 being just a little bit more appealing because it does a better job at being different despite the fact that the LG G4 is also trying to accomplish that feat. Plus, the LG G Flex 2 is cheaper, which is always something to take into consideration. That said, the LG G4 does comes with a better display and a set of specs that will likely not be surpassed any time soon so this is definitely not an easy decision to make. At the end of the day, it boils down to individual preference and it will be up to you to decide which of these smartphones will be best suited to your needs.